Many times after writing a text or placing an image over the original one we have to re align the new additions by moving that. Here the move tool will be required. This tool can move any layer and we can position it as per our requirement. 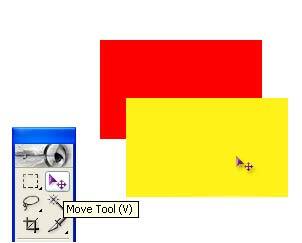 The move tool is is frequently used in Photoshop. This tool is beside the marquee tools.The move tool lets us drag a selection,layer to other new location. We can also use move tool to allign selections and layers and distribute layers in the image. Here we can see two rectangles with different colors one over the other. 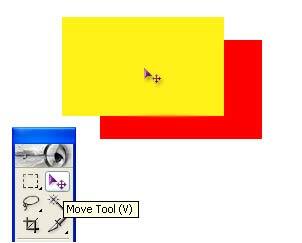 To drag only yellow color just click the move tool on the yellow rectangle and drag it to your desired place. Here we can see two rectangles with different colors one over the other. This is the final result after dragging.